Have you ever seen a wad of chewing gum on the sidewalk and wondered about the person who spat it out? Artist Heather Dewey-Hagborg has done more than wonder. She collects errant hairs, cigarette butts, fingernails, and discarded chewing gum from public places and using the DNA she finds, creates 3D portraits of how the owners of this discarded genetic material might look. Dewey-Hagborg's Stranger Visions project is fascinating in both its concept and its limitations. She explains on her blog that she originally conceived of the project while sitting in her therapist's office, where she noticed a hair lodged in a crack in a picture frame. She wondered about the person to whom the hair had belonged, imagining what they might look like. Tapping her inner forensic scientist, she extracts the DNA from these found items and referencing a database of regions of DNA that are known to code for certain traits (she told the Smithsonian that she has 40-50 different traits she uses, including things like the space between the eyes and propensity to be overweight), she creates a portrait using the Basel Morphable Model. 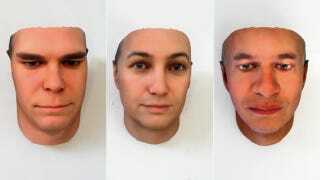 Once she has a portrait, she prints it out using a 3D printer, creating an imagined version of the stranger who left behind their DNA. You can see three of those portraits above, and more on her website. Of course, DNA can tell us only so much. Since Dewey-Hagborg doesn't know the people behind the DNA, she can't compare the portraits to the real human beings, although she has created her own genetic self-portrait. Even if we had a complete picture of how DNA links to facial features, these portraits wouldn't account for the role of epigenetics and environment in how our features develop. Additionally Dewey-Hagborg has found certain limitations with the Basel Morphable Model itself; most of the people used to train the system were of European descent, which has led to some problems in creating portraits for people who are not of European descent. Still, her endeavor may have utility beyond being an interesting art project. The Smithsonian has a fascinating profile of Dewey-Hagborg that reveals more about her process. It ends on this note: Dewey-Hagborg was recently contacted by a medical examiner on a cold case, hoping she could create a portrait of a woman whose remains have gone unidentified for 20 years. Perhaps a DNA portrait—even a highly imperfect one—could shed a little light on this mystery.